My students created a Google Presentation about working in Meteghan, Nova Scotia. This is a lesson that I did in March 2013. My students had created a number of Google Presentations already. They had also learned the terms natural resources, wildlife, goods and services as they related to Iqaluit. In this activity, they reviewed these terms and applied them to Meteghan. They also reviewed how to use keywords to search for images. Each day we did one slide and one term. We would review what the term for the day meant. I would have students list examples for that term specific to Meteghan. Then students would create a slide for that term. This was guided. We came up with the definition for the term and that was the title for our slide. Then students had to search for images to represent examples for Meteghan. 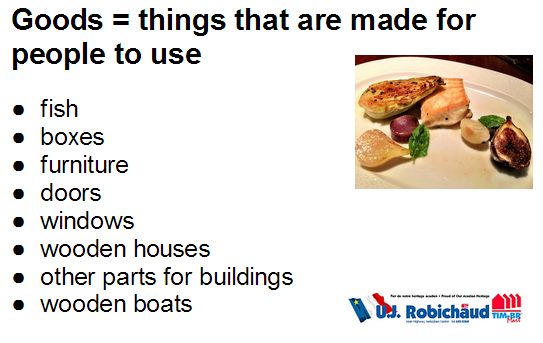 For goods and for services they also typed examples. After students had a sufficient amount of working time, we'd review what they came up with and I used that to create an example slide on the Smartboard. On the last day they shared it with me. Students logged onto Google Apps and then set their netbooks aside. We reviewed what goods were. Students were able to look at a glossary before answering if needed. Half the class read one page out loud. The other half had to identify three goods that were shared on that page. Then they switched roles. Half the class read a second page out loud. The other half had to identify three goods that were shared on that page. I reviewed how to create a new slide that had a 'title and body'. We reviewed what goods were again and I typed a student's answer as the title. I reviewed how to create bullets. I asked for one example of a good and used that to demonstrate that I wanted a list. Then students opened their presentation (they had already started the presentation) and created the new slide. After students had a sufficient amount of working time, I had them share what goods they added to their list (I had said they needed a minimum of six) and added what they shared to my example on the Smartboard. I then explained they needed three images for this slide. We reviewed what some good keywords might be. I had them working time to add their images. This activity was intended to support the students learning about working in Meteghan, therefore it was not taken in for assessment. 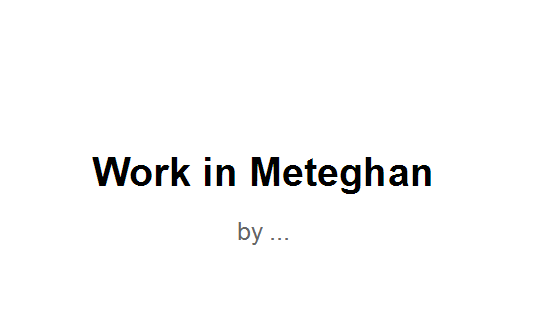 Here is the presentation I created as a summary of what my students did (step 5) - Working In Meteghan. Here is an example of a student's presentation - Example of Working In Meteghan. This example of creating a Presentation shows students doing lots of thinking about what terms mean and evaluating whether an image represents the terms, a meaningful and engaging use of technology.